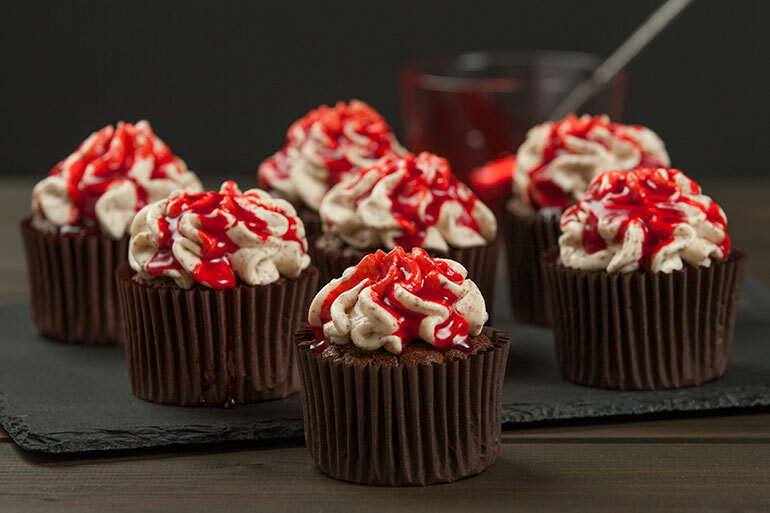 Blood and brain cupcakes – where ghastly meets yummy all in the name of Halloween baking fun! Get your bake on this Halloween and create these ghoulish brain cupcakes with a simple piped icing piping and a sweet raspberry coulis. So easy, you don’t need supernatural baking skills to pull them off. Even the kids can do it. Let’s get our brain baking game ON! Sift the dry ingredients into a large bowl. Add the sugars and stir to combine. Bake for 20-22 minutes or until cake skewer inserted into the centre comes out clean. Allow to cool. To make butter cream icing:​ Beat butter with icing sugar using an electric mixer until light and fluffy. Beat in vanilla essence and milk until smooth, adding extra milk or icing sugar if necessary. To make raspberry coulis:​ Place raspberries, sugar and water in a small saucepan and bring to a boil, reduce to a simmer and cook for several minutes. Remove from heat, puree and chill. To decorate: ​Pipe butter cream onto each cupcake in a swirling pattern. Drizzle the cooled coulis over the butter cream to resemble dripping blood. CHEAT TIP: If you don’t want to bother making your own raspberry coulis, just grab a bottle of good old Cottee’s strawberry topping! A dozen Halloween blood drizzled cupcakes, the perfect brain food! In the mood for some more spooky baking? Try our cute bat cupcakes.